In passing amendments to the Child Labour (Prohibition and Regulation) Act, 1986, earlier this year, India's political class failed the children of the country. To put it mildly, this was a devastating move. Instead of banning child labour in its entirety, the new law allowed for children to work in family enterprises and reduced the list of banned jobs for children from 83 to just three. Now, it is legal for a child to work in a brick kiln, a blast furnace, or a garment factory provided the owner is able to convince the authorities that he or she is related to the child. With India’s wide and lose kinship structures, anybody can easily be proved to be related to anybody. This has opened a backdoor for children to be forced to join the workforce. Each morning, 168 million child labourers struggle in the harshest of conditions instead of learning in school. Of them, 5.5 million are child slaves. Nobel Laureate Kailash Satyarthi had his sight fixed on eradicating child labour and hasn’t been dismayed by how non-conducive the state of affairs in the country are. His struggle bears testimony to the fact that there is no time and no need for cynicism because a lot of lives are in need of urgent help. While the government essentially negated Satyarthi’s 36-years of hard work, in which he rescued more than 84,000 children, the 2014 Nobel Peace Laureate decided to build a singular moral voice that speaks for humanity, not with political agenda or for economic gain, but a voice that cuts through wry debates and blame-games; a voice for those who need it the most. Child slavery is a modern reality. In India, 41 percent of the population is below the age of 18 but as Satyarthi puts it, if we don’t invest in them we cannot consider them a dividend. On Sunday, the ‘100 million for 100 million’ campaign was flagged off by President Pranab Mukherjee at Rashtrapati Bhavan’s forecourt, amid the presence of laureates and leaders from across the world and hundreds of children. The campaign will call upon 100 million young people to learn about their own rights and the lives of other children, who live in unimaginable situations caused by conflict, exploitation and extreme poverty to build a child-friendly world. Satyarthi’s foundation plans major campaigns and outreach events in 10 countries, covering every continent. By 2019, the campaign will operate in over 60 countries worldwide and would have secured 40 million supporters. The campaign's success will be measured by a change in public opinion on issues of child labour, exploitation and child refugees, the number of young people taking action on behalf of the other young people around the world and over the longer term, the policy and practice change and improved outcomes, such as the global reduction in the number of child labourers. “We need both a top-down policy approach and a bottom-up social initiative,” said Angel Gurria, secretary-general of the Organisation for Economic Co-operation and Development (OECD). He added that all the evidence needs to be collected and combined in a way that it assists policy makers. “We need to speak louder and jump higher,” he exclaimed. “Child rights cannot be tackled in isolation. Unless we deal with large-scale problems like poverty, social injustice and terrorism, we cannot uproot this social evil. Even the best policies are not implemented on-ground because there is massive corruption,” noted Tawakkol Karman, 2011 Nobel Peace Laureate from Yemen. She suggested that since the summit was launched in India, the country should become the headquarters of the international alliance for protecting kids’ rights. What happened in the momentous confines of the Rashtrapati Bhavan was historic and unprecedented. 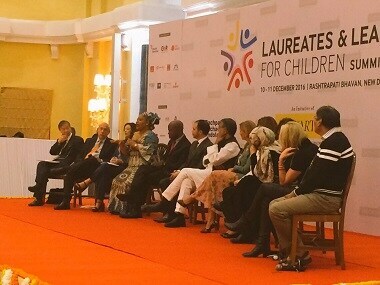 In the Indian capital, the first chapter of the Laureates & Leaders for Children Summit gave the world the message that a child’s arms cannot be stretched to the left and to the right. Children cannot suffer at the hands of ego-driven ideology clashes and lethargic policies. India’s political leaders, with the exception of Piyush Goyal Minister of State (IC) for Power, Coal and New & Renewable Energy, didn’t address the summit. Among other things, the world leaders concluded that we need greater political awareness and that the moral deficit is nowhere but inside our willingness.